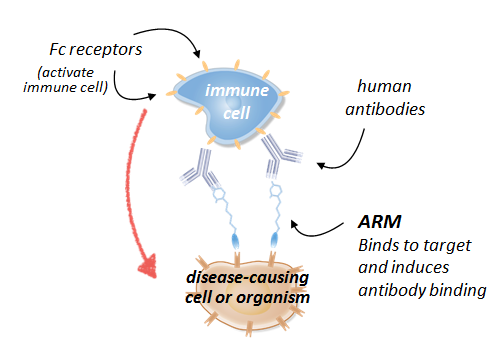 Antibody Recruiting Molecules (ARMs) are bispecific molecules that recruit endogenous antibodies to target cancer cells for immune destruction. They are comprised of two distinct binding domains connected by a tunable linker domain. One binding domain attaches to circulating antibodies and the other attaches to tumor cells. These molecules are engineered with modular components that are readily interchangeable, giving the platform tremendous flexibility to target a variety of tumor types. The ARM's tumor-binding domain binds tightly to specific molecules expressed on the tumor cell's surface. Its antibody-binding domain attaches to antibodies already present in the patient's body and the micro-environment of the disease cells. By creating this “bridge”, ARMs enable endogenous antibodies to coat the cell, leading to the destruction of the tumor cell through the body’s innate antibody-mediated immune mechanisms. Similar to biologics, ARMs directly engage patients’ immune system to destroy cancer cells by connecting target cancer cells with components of the immune system. However, compared to biologics, ARMs are more versatile in that they are smaller and more tunable. They have potential to be safer and more effective because they are non-immunogenic and can attach to a wider range of binding sites on tumor cells. They are fully synthetic and modular in design, making them much faster and less costly to produce compared to biologics.